If you need gift ideas for your building manager, valet, cleaning person, child’s teacher or any other service provider, flowers are perfect. They’re beautiful and festive, and they naturally come across as a genuine and caring present. White flowers can make a dramatic statement or simply portray the magic of the winter season. Give a gift of a bouquet of all white flowers. Go with just one variety or a blend of blossoms. They’ll look stunning either way and be accepted graciously, we’re sure. Think about Asiatic lilies, Cala lilies, roses, peonies and anemone. Mix up a bouquet of white and red amaryllis and spray roses for the holidays, or go with all red or all white. Two festive colors for Christmas look fantastic in floral display, so get creative. 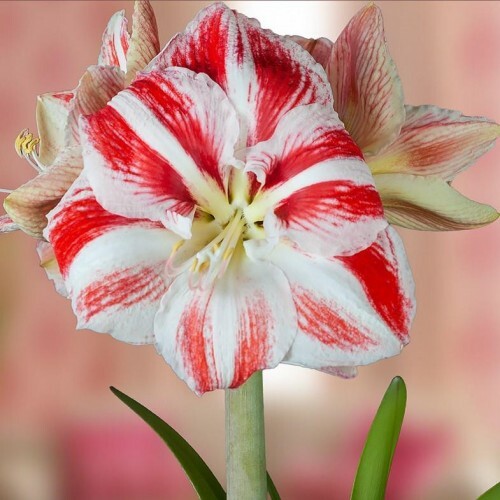 Candy striped amaryllis are fun flowers to give and they make an impact. You can also put together something special with red juniper berries, white roses, pomegranate, red and white orchids, red cosmos and red black beauty roses. There are so many types of mini Christmas trees out there, in grocery store floral departments, garden centers, Christmas tree lots and even big box stores. You’ll find traditional pines and even little trees made with unconventional holiday plants like rosemary. Consider decorating a mini tree with pint-sized ornaments, garland or even dried fruit. Other holiday flowers you can give to service providers, in a professionally made bouquet or a casual arrangement you put together yourself, include hypericum berries, poinsettias, bunches of greenery, ivy plants and carnations. Are you giving gifts to service providers this year? If so, what are you giving?